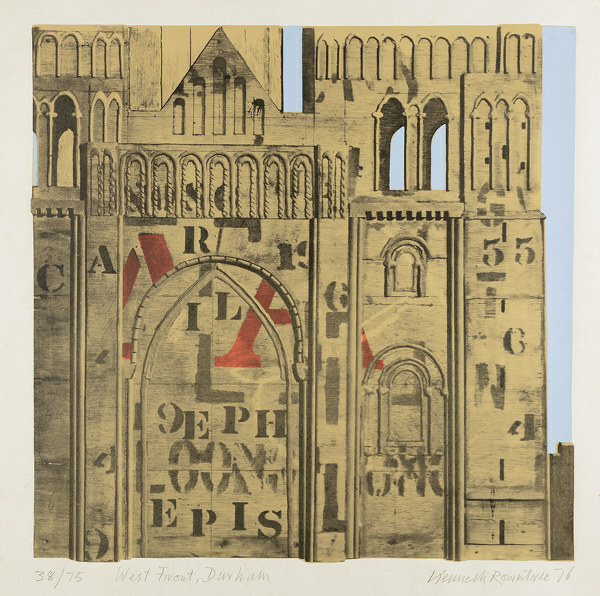 Like several of his contemporaries, John Piper in particular, Rowntree loved painting scenes that enabled him to incorporate decorative lettering; he exploited this to the full in his Recording Britain watercolours, especially in his depiction of tombstones in the graveyard at Barnston, Essex and the interior of St Mary’s Church, Whitby, with its great panels from the Book of Exodus - the capitals picked out in red - exhorting the congregation to have ‘none other Gods but me.’ In the immediate post-war years some well-placed publishers’ commissions, particularly those from Collins and from Marghanita Laski at Pilot Books, enabled him to exploit his penchant for lettering; while others, too, noted his responsiveness both to subject matter and mood as reflected in such covers as the King Penguin A Prospect of Wales . He also received commissions from the BBC - for a Jubilee cover for The Listener - from Shell, and from various advertising agents, with his talent for inventiveness and playfulness in the field of graphic design achieving its apogee in his four 1950 Vogue cover designs - Spring, Summer, Autumn and Winter - which, to the public’s loss, were never used. It is in these designs above all that the sensitiveness of his aesthetic antennae is most apparent. Although both in his painting and his design work he was seldom totally original, he was always acutely aware of what was appropriate for the job and alert to every nuance of taste. When appropriate he would, with humour, tip his hat to Nicholson, Piper or Peggy Angus, make a genuflection to Ravilious or raise a glass to Surrealism, but at the same time all his designs whether for murals, textiles, advertising material, or book and magazine covers remain unmistakably and uniquely Kenneth Rowntrees.